The Milwaukee Symphony Orchestra (MSO) was part of a post-World War II cultural renaissance in the city, when it earned national and international renown. Numerous attempts to establish a professional local orchestra dated as far back as the 1890s. Individuals from throughout the Midwest formed “pops” style ensembles, but support for these organizations waned. With performing arts options limited, the Chicago Symphony Orchestra established a strong presence in Milwaukee. Following the First World War, anti-German sentiment took a serious toll on Milwaukee’s cultural organizations. The Depression foiled Frank Laird Waller’s attempts to establish the Milwaukee Philharmonic Orchestra in 1929. In 1933, the WPA briefly sponsored an orchestra under the direction of Sigfrid Prager, but financial support was withdrawn as the United States neared war. Polish musician Jerzy Bojanowski established a chamber orchestra in 1935, but after the initial buzz wore off, he joined the “Music under the Stars” program. Finally, in 1953, John-David Anello, Sr. established the Milwaukee Pops orchestra. Evolving out of a series of free summer concerts that were held in Humboldt and Washington Parks, Anello’s “pops” ensemble performed throughout the 1950s and enjoyed moderate success. In May 1959, it officially changed its name to the Milwaukee Symphony Orchestra. Harry John Brown was appointed permanent conductor in 1960. 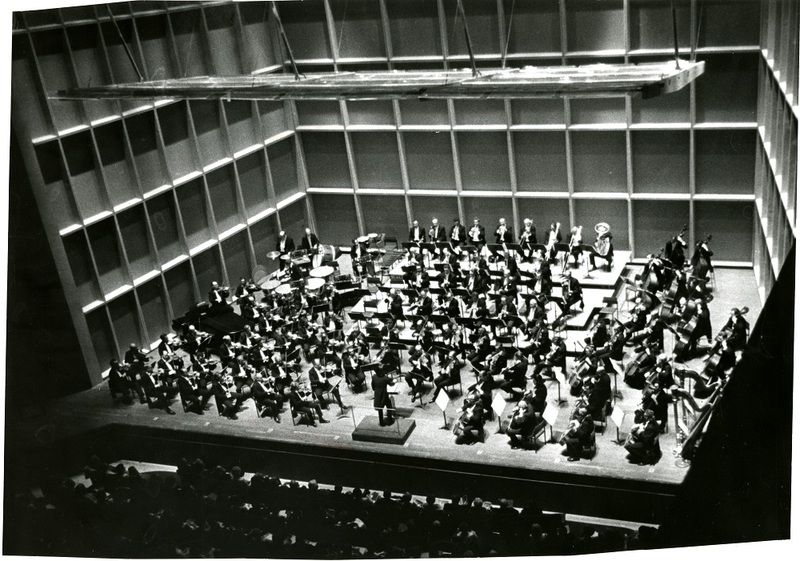 Under Brown, the orchestra grew in size and reputation and performed in several other Wisconsin cities during the 1962-63 season. By 1966, Milwaukee became the youngest orchestra ever to achieve official recognition as one of the nation’s major symphonies. When Brown stepped down in 1968, he was replaced by Kenneth Schemmerhorn. In Schemerhorn’s twelve years with the MSO, he raised the group’s quality and professionalism. He led them in their debut at Carnegie Hall, their first international tour, their first recording, and in their first performance of contemporary music. Schemerhorn was replaced by Lukas Foss in 1981, who continued the group’s experimentation with contemporary and American music. Foss also led the symphony on its first European tour in 1986. Foss and Zdenek Macal, who succeeded Foss in 1986, presided over a difficult financial period in MSO’s history. Throughout the 1980s and early 1990s, the young group grappled with the fact that it had no major endowments to rely upon for support. Many of the country’s top orchestras predated the Milwaukee Symphony by thirty years. Their age allowed them the opportunity to build a network of wealthy supporters, who often left them endowments following their deaths. Milwaukee’s funding, however, came primarily from the United Performing Arts Fund. With so many arts groups in need of UPAF funding, the MSO experienced its share of financial uncertainty. Another consequence of the MSO’s rise in status was that it lacked the capacity to build up a strong audience to support it. In a city struggling with Rustbelt decline, questions were raised about whether cultural life would suffer along with industry. In spite of financial problems, Macal did broaden MSO’s international reputation by leading them on a tour of Japan in 1992. Under Andreas Delfs, who took the helm in 1997, MSO launched an educational outreach program known as Arts in Community Education. Its effort to integrate music and art into Milwaukee area schools was a model for other major orchestras across the country. Delfs also enhanced MSO’s international reputation through touring and technology. In 1999, MSO became the first major U.S. orchestra to perform in Cuba since the beginning of the trade embargo. The visit was quite controversial, as it coincided with the international debate over the return of six-year old Cuban refugee Elian Gonzalez to his father in Cuba. Although some groups strongly criticized the trip, the orchestra’s visit was praised by others as a step toward thawing the lingering Cold War tensions between the United States and Cuba. The MSO also made waves closer to home with its technological innovation. Throughout its short history, the symphony has been a leader in musical technology. They began recording for radio broadcasts in 1976. Over the next thirty years, they built an archive of over 400 recordings. In 2005 they capitalized on this collection by becoming the first major symphony orchestra to make recordings available for download on iTunes. The first fourteen performances were listed on October 4, 2005. When Delfs stepped down following the MSO’s 50th anniversary, he was replaced by Edo de Waart, who has continued to build on the organization’s stellar international record. ^ John Gurda, The Making of Milwaukee (Milwaukee: Milwaukee County Historical Society, 1999). See also “Milwaukee Symphony Obtains Official Recognition as ‘Major,’” The Milwaukee Journal, June 15, 1966, p. 1. ^ Ann Drinan, “Orchestra Spotlight: Milwaukee Symphony Orchestra,” Polyphonic: The Orchestra Musician’s Forum (blog), February 2007, http://www.polyphonic.org/spotlight.php?id=5, now available at http://www.esm.rochester.edu/iml/prjc/poly/orchestra_spotlight/milwaukee-symphony-orchestra/. The Chicago Symphony Orchestra traditionally played a series of ten concerts per year in Milwaukee from 1915 through the mid-1980s, making many question the need for Milwaukee to have its own symphony orchestra. See also, Gurda, The Making of Milwaukee. ^ Walter Monfried, “Milwaukee in Tune with Its Symphony: Professional Orchestra, Now in Fourth Season, Appears to Be Here to Stay,” The Milwaukee Journal, September 30, 1962, p. 10. Monfried also details the attempts of German conductor Julius Erlich to establish a chamber orchestra, the Milwaukee Sinfonieta, in the early 1940s. Both failed due to lack of financial support. ^ Ibid., 10. See also, John-David Anello, Sr., Musical Memories: The Universe Has Music for Those Who Listen, The Memoirs of John-David Anello, Sr., edited by Catherine McGarry Miller (Shorewood: Musical Memories Publications, 1993). Anello opted to use the name “Pops” to avoid comparison or competition with the very popular Chicago Symphony Orchestra. ^ “Symphony at Large,” The Milwaukee Journal, June 2, 1963, p. 3. The first tour included performances in Cedarburg, Green Bay, Rhinelander, and Wausau. ^ “Milwaukee Symphony Obtains Recognition as ‘Major,’” The Milwaukee Journal, June 15, 1966, p. 1. MSO had formerly been ranked as a metropolitan orchestra and earned its status among the top 26 major symphonies when it reached an annual operating budget of $500,000. The honor was bestowed by the American Symphony Orchestra League. ^ Leon Cohen, “Veterans Reflect with Pride,” The Milwaukee Sentinel, September 2, 1983, p. 15; Lawrence B. Johnson, “The Symphony at 25: Foss & Company Pay Rich Dividends,” The Milwaukee Sentinel, September 2, 1983, p. 14. The group’s first international tour was to Santo Domingo, and since that first performance at Carnegie Hall in 1972, the group has returned 12 times. ^ Drinan, “Orchestra Spotlight: Milwaukee Symphony Orchestra,” 1. ^ Bruce Murphy, “The Unfinished Symphony,” Milwaukee Magazine, March 1986: 76-87. ^ Tom Strini, “Cuba Trip Puts MSO on World Stage—Brief Mission Is First by Major Symphony since ‘60s,” Milwaukee Journal Sentinel, December 12, 1999, p. 1. Delfs took advantage of President Clinton’s easing of travel restrictions, gaining worldwide attention. The trip was covered by NPR and the New York Times. In addition to performing two free shows, MSO brought reeds for wood instruments, strings, and other musical items that were in short supply in Cuba. ^ Tom Strini, “It’s Official: MSO to Visit Cuba in December—No Major U.S. Orchestra Has Performed There in 37 Years,” Milwaukee Journal Sentinel, October 21, 1999, 7. ^ Drinan, “Orchestra Spotlight: Milwaukee Symphony Orchestra,” 1-4. Orchestras in Los Angeles, Minnesota, New York, and St. Paul have since followed suit. MSO has since made recordings available through their own website. They have a distinct advantage, as they have over thirty years of recorded materials from which to draw. MSO has also been exploring binaural recordings—a 19th century technology which produces recordings with better quality for headphones. The impetus for the iTunes innovation was largely successful because it came from the musicians themselves, rather than the board of directors. ^ Tom Strini, “MSO Scores with Selection of Dewaart as New Director,” Milwaukee Journal Sentinel, January 15, 2008, p. 2. deWaart happened to be settling in the Middleton area with his wife and two small children at the time. Rather than scouting out an up-and-coming director, MSO was fortunate enough to sign a seasoned veteran like deWaart, who had lead the Hong Kong Philharmonic, the San Francisco Symphony and the Minnesota Orchestra. Anello, Sr., John-David Musical Memories: The Universe Has Music for Those Who Listen, The Memoirs of John-David Anello, Sr. Edited by Catherine McGarry Miller. Shorewood: Musical Memories Publications, 1993.